I have been sharing what I learned by doing My Obstacle Courses with other parents and since Andrew is now 7 years old, I frequently get questions about working with children who are much younger. I began doing this at home with him routinely when he was 4 years old but used some of the activities with him as early as 2 years old (I just hadn’t put it together that that’s how he wanted to play with me – ah, hindsight!). My advice to these parents is to use toys that they have (perhaps in a different way from their intended purpose), use real objects as much as possible and most importantly make it fun. 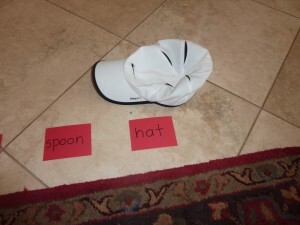 Here is one station activity I have used to build literacy and vocabulary skills. 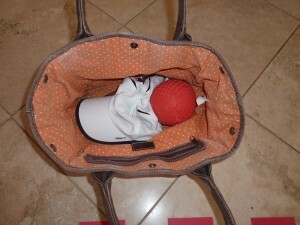 I shared in a post last week (A Bit of Mystery and Intrigue) how I love to use tote bags to hold items and this is an activity modeling how to find out what your child knows using the tote to add some mystery. A hat matched up with the word "hat." I guess the ball is next! 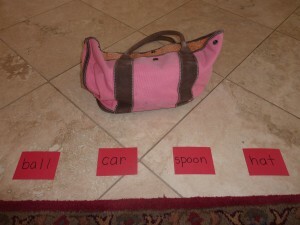 This station idea is like creating a real life flash card for your child with the written word name and actual object. All of the objects matched up with their words. Ask them to find it in the tote bag. Match up the object with the word. 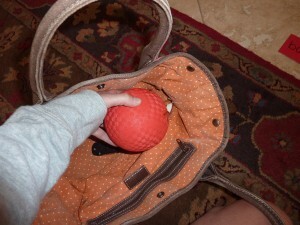 By being able to get the object, this removes the need for them to speak in order to show they know what it is. 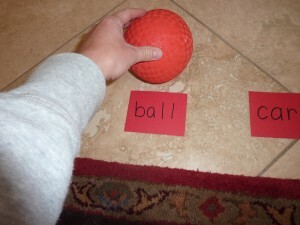 We still work on speech skills but that is not the primary purpose for this activity. They are also getting the benefit of receiving information through all modes of learning – visual, auditory, and kinesthetic. If there is something that your child does not know or understand, take note of it so you can be sure to incorporate this more often. This My Obstacle Course station activity empowered him because he could demonstrate his knowledge without speaking intelligibly and it empowered me by learning specific information about the sorts of things he knew and didn’t know. 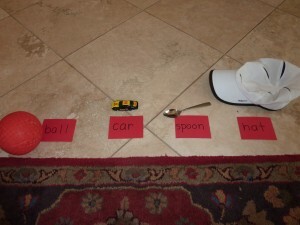 I encourage you to think about what literacy skills your child is working on and see if there is a way to add some fun by incorporating real objects. There are many frustrations that parents of late talkers or non-verbal children experience but I think one of the things that was most difficult for us was that we did not know exactly what he knew or didn’t know. He would point to things for us when it involved books or catalogs that he enjoyed or if it meant he would get tickles as a reward but outside of those times, we could only guess. After his neuropsychological evaluation (which I got to sit in on and watch while he ignored the evaluator – talk about a fun morning!) showed nothing we didn’t already know, I knew it would be up to me to find out. It was a long process, with a lot of trial and error but in the end, I realized that with a little bit of planning and creativity, I could provide ways to find out.